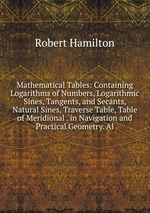 Аннотация к книге "Mathematical Tables: Containing Logarithms of Numbers, Logarithmic Sines, Tangents, and Secants, Natural Sines, Traverse Table, Table of Meridional . in Navigation and Practical Geometry. Al"